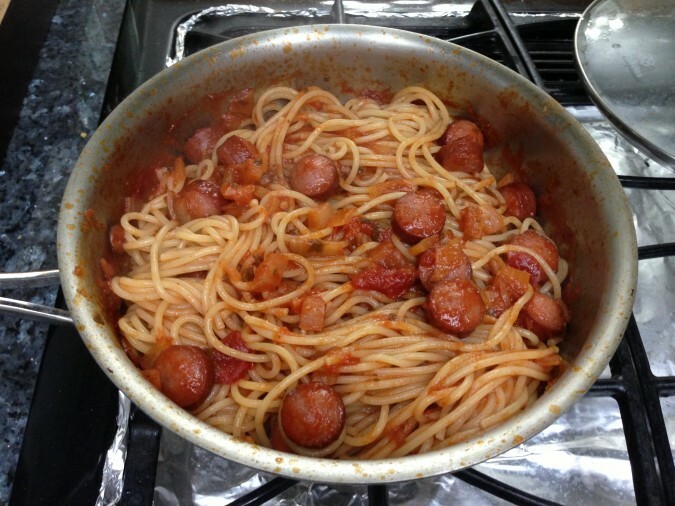 I can’t believe after years of food blogging I never made my all time favorite childhood dish, spaghetti. The funny thing about cooking spaghetti is, there are hundreds of ways to make different spaghetti sauces, but there is only one way to make the perfect pasta and that is the most important part of the dish.A lot of people think that the sauce is what makes spaghetti but I will argue that the pasta makes the dish. Just like a good pizza, where the dough is the most important ingredient, a good spaghetti dish MUST start with a well cooked pasta. Recently I made the sweet version so that is what I will cover in this post. Just remember, preparing the noodles and constructing the spaghetti is always the same, the only difference is what you add into the sauce. 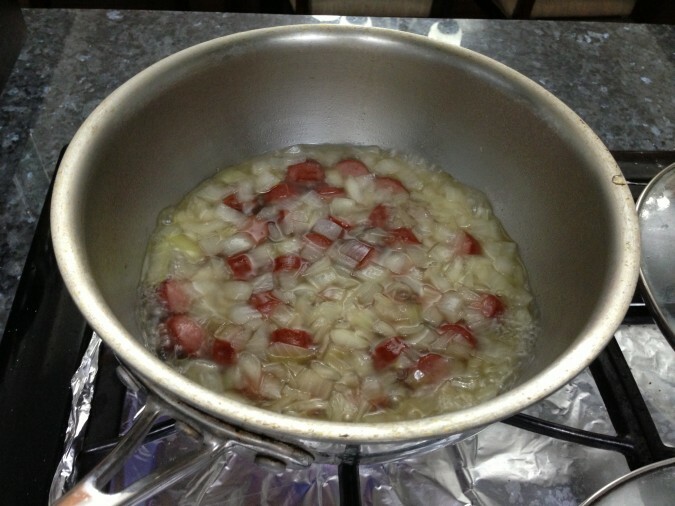 Step 1 – Bring a large pot of water to a boil. 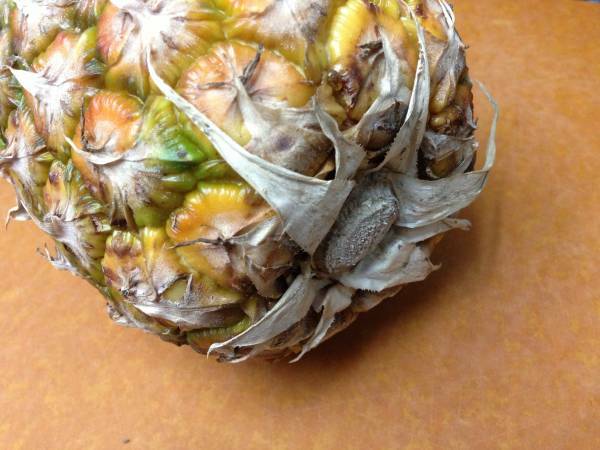 While your water heads up chop up your ingredients. 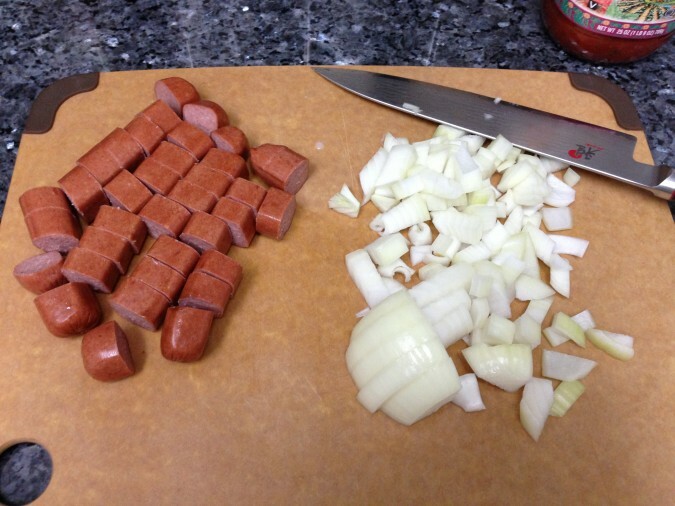 For this version I cut my hot dogs into bite size pieces and diced up my onions into tiny pieces. 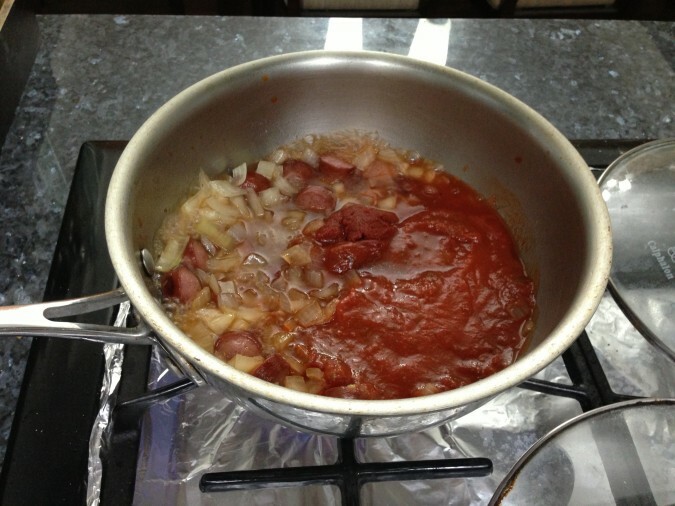 Step 2 – In a sauce pan or pot, add in your hot dog, onions, about 1 1/2 Tbsp of sugar and enough water just to almost cover the ingredients. Cover the pan and bring to a boil. I usually do one hot dog and 1/4 onion per person. Now a lot of people have asked me in the past why do you need such a large pot of boiling water. Why not just use a smaller pot with less water? 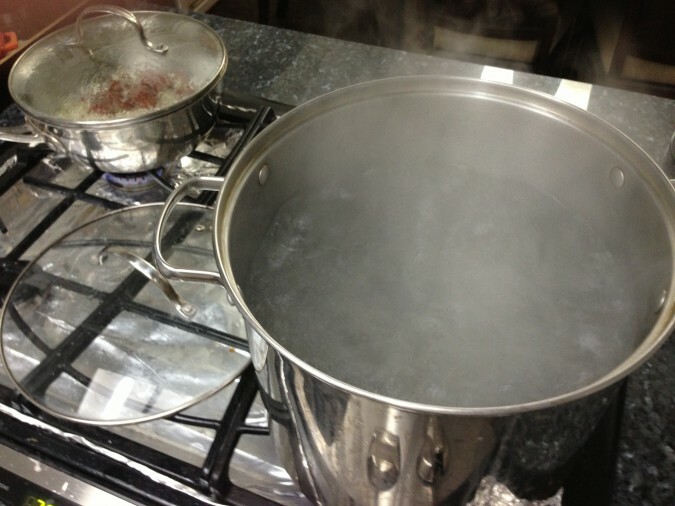 There are two reasons you want to use a large pot of water, the first is because a big pot of boiling water will not drop in temperature as much when you add in the noodles compared to a small pot of water. If you add your dry noodles into a pot of boiling water you want the water to stay hot so the noodles start to cook right away when they hit the water. If you use a small pot the noodles will hit the water and drop the temperature so it takes time for the water to heat back up. During that time the noodles are not properly cooking so they will start to stick to each other instead of evenly cooking. The second reason is because spaghetti noodles release starch into the water when they cook, you need to give the starch a lot of water to dissipate into or else your water is going to end up getting thick, which again slows down the boiling processes of cooking your noodles. Step 3 – Once your water comes to a hard boil (violent bubbles) add in about 1 Tbsp of salt then add in the noodles. 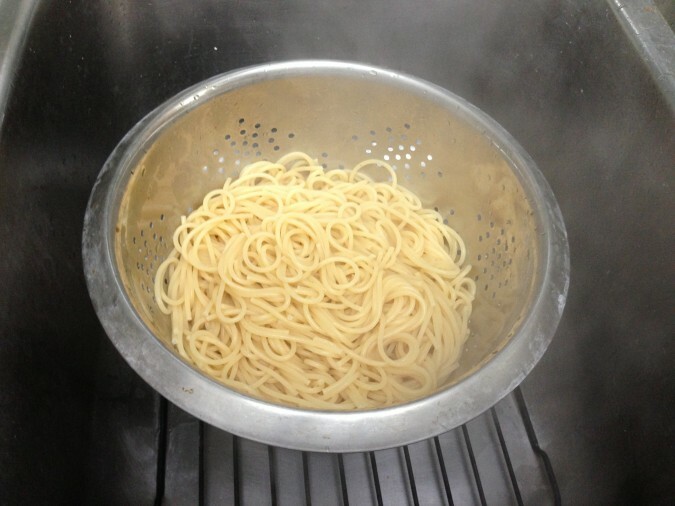 When you add the noodles into the pot don’t just drop them all into the pot, fan them out in a spiral shape so there is minimal contact between each noodle (see image above). This will help the noodles to not stick together. After about a minute or two of cooking, use some tongs and move the noodles around to make sure they are not sticking to one another. Once the water comes back to a hard boil drop the temperature down to medium. 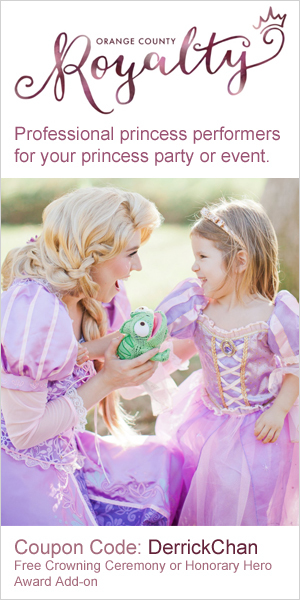 You want the water to stay boiling, but at a soft boil (not violently bubbling) and make sure you do not cover the pot (or else the pot will bubble over due to the starch in the water, leave it uncovered). Total cooking time of pasta should be between 8-9 minutes. 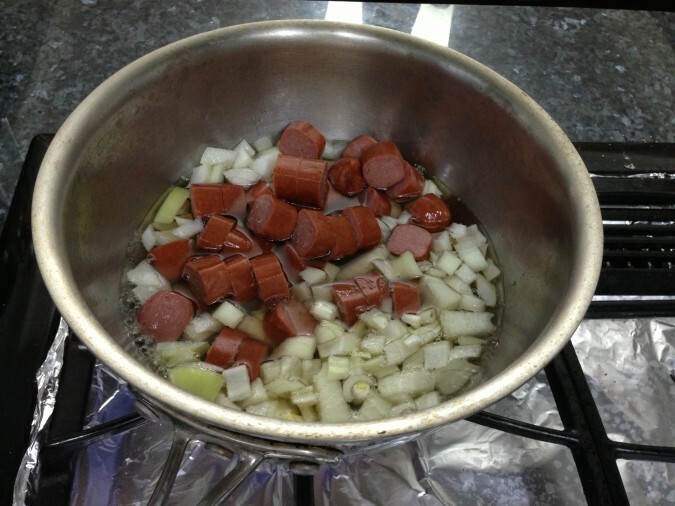 Step 4 – By now your hot dogs and onions should have cooked down so that the onions are tender and the center of the hot dog is bulging out. 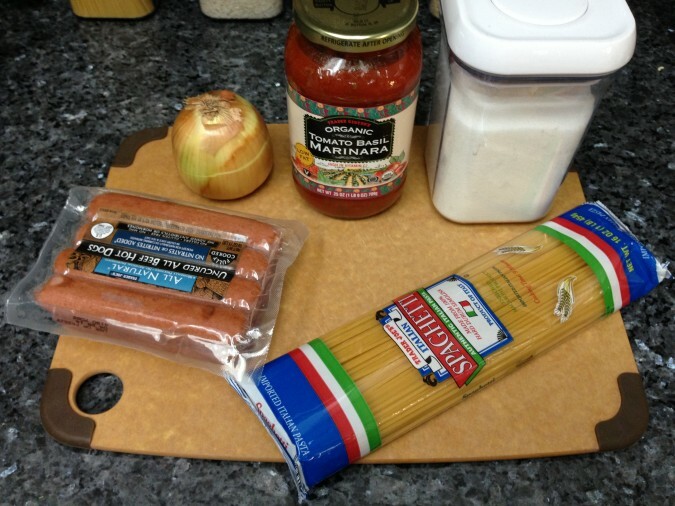 Add in your marinara sauce, I usually add in 1/4 bottle per person eating. Let the sauce cook uncovered while you finish off the noodles. Step 5 – After 8 minutes of cooking your noodles use your tongs and try a piece of noodle. You want your noodles to be al dente, which means you want the noodle to be soft but still firm enough so it doesn’t dissolve in your mouth. A lot of cooks refer to this as, you want your noodle to have some bite in it. A good way to to tell is try a noodle after 7 minutes, it should be soft on the outside but still have a slight crunch on the inside. You want to cook the noodle just long enough so the inner crunch is gone, then immediately remove the noodles from the boiling water by straining them into a colander. Now this is the most important part of making spaghetti… DO NOT RINSE THE NOODLES IN COLD WATER!!! If you do, you are going to end up with a crappy wet noddle swimming in a watery marinara sauce like the cafeteria spaghetti we’ve all had at one point in our life which we hated. 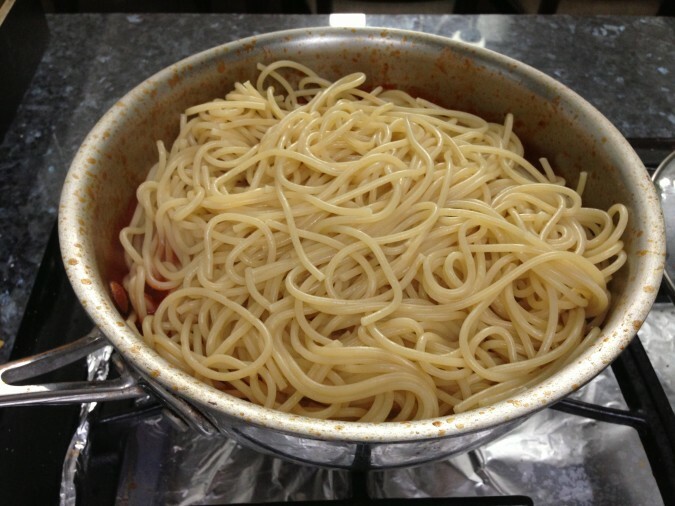 When the noodle is cooked and strained the pasta has a very sticky outer layer which will grab onto the sauce and pull the sauce into the noodle. 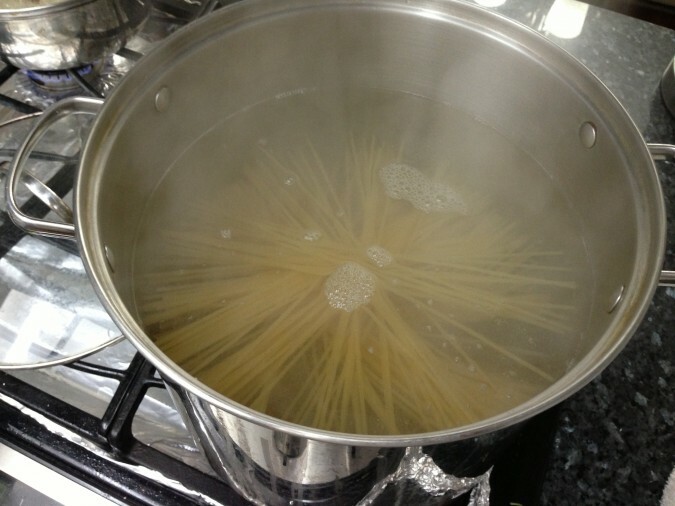 This is the secrete to making good spaghetti, you need the noodles to hold onto the sauce so do not rinse the noodles. Let the noodles drain for a few minutes while you finish the sauce. 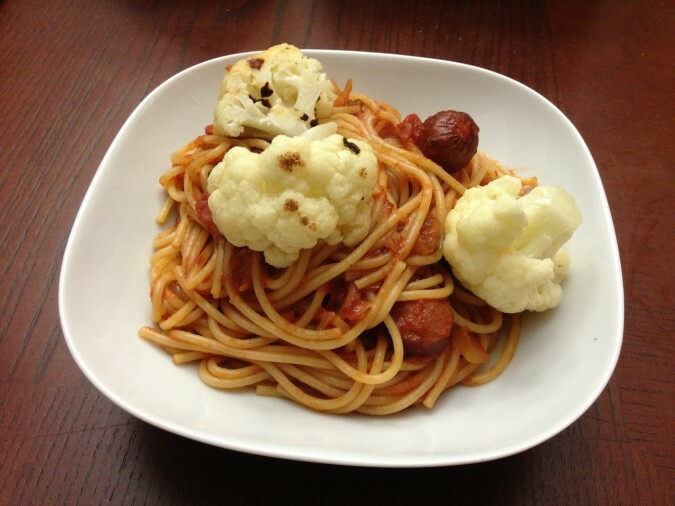 Step 6 – For this meal I wanted to add a little bit of spice to contrast my sweet pasta, so I decided to cook some cauliflower. I used the same large pot I just cooked my noodles in and under high heat I added about 2 Tbsp of cooking oil. 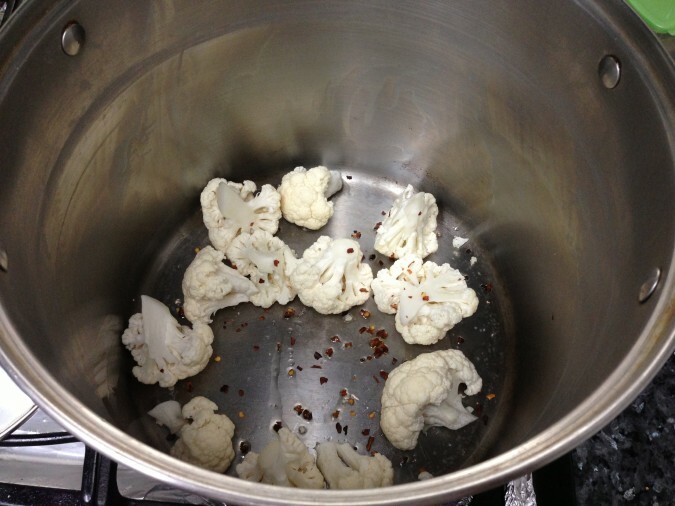 I then tossed in my cut cauliflower with some red pepper flakes, the same kind you use for pizza. Step 7 – Once one side of the cauliflower starts to brown add in about 1/3 cup of vegetable stock (any stock will do) then immediately cover the pot to let the cauliflower steam. 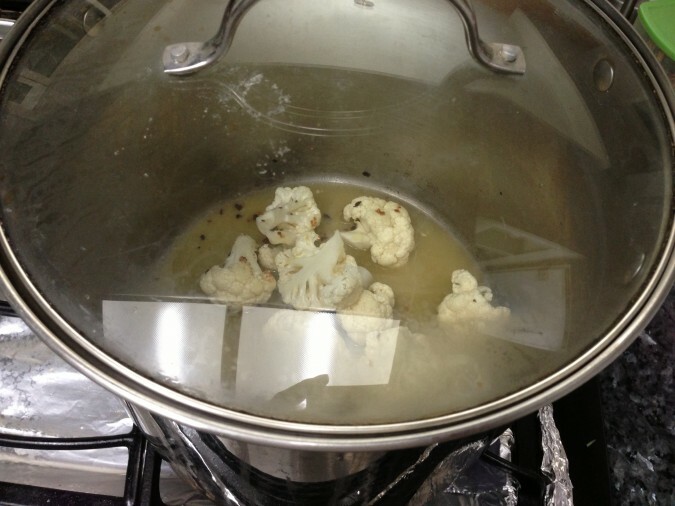 Steam the cauliflower for roughly 5 minutes, until tender. 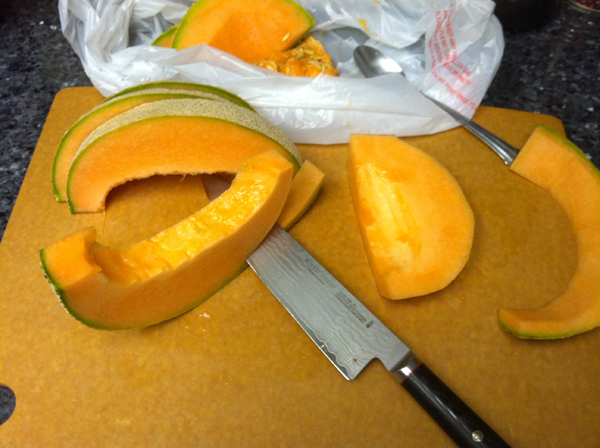 Some people like it really soft while others like it just a little tender so cook as long as you prefer. 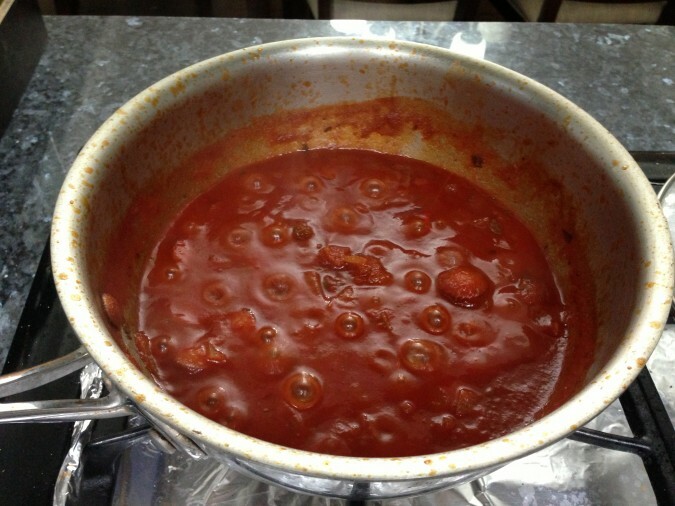 Step 8 – By now your sauce should have reduced a bit and it is ready to take on the pasta. Dump the strained pasta on top of the sauce then fold the pasta and sauce together gently. Notice how the sauce is actually sticking onto the pasta so there isn’t a pool of sauce at the bottom of the pan. The noodles have completely soaked in the sauce so every bite will now taste perfect!